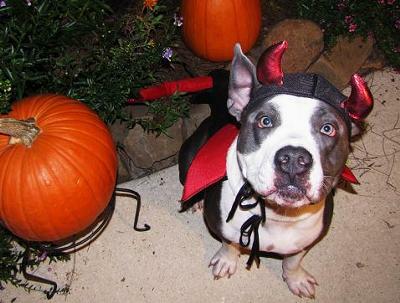 Diablo in the Pumpkin Patch! Can I have some candy please? I'm such a little cutie! This is my 1 year old blue gator pit bull, Diablo! Since he was a puppy, he was always getting into messes, so Diablo is the perfect name for him! He is the best dog you could ever ask for. Diablo is super goofy and clumsy, but it just makes us love him all the more! We adopted him from a local breeder last year, and have watched him grow up into an adorable little devil! Diablo's favorite thing to do is go to the dog park and play with the other doggies. The best thing about Diablo is that he is always happy! His bouncy walk can make anyone laugh! I'm so glad we adopted him. At first, my parents were reluctant to let him live with us because of his breed, but after seeing that he is the most harmless and loving dog in the world, they changed their minds and let him live with us. 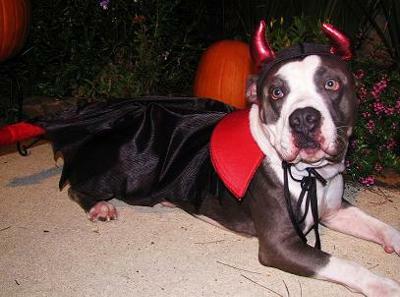 You should vote for Diablo because he would love to win, and what better costume to vote for than a devil for Halloween! I hope his pictures do him justice and they make it easy to see why we love him so much! He is the best dog I could ever ask for and I love him so much! 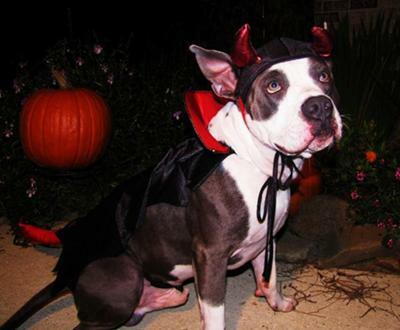 Comments for DIABLO THE HALLOWEEN DEVIL! Omg too cute Ashley !!! Good luck !!! 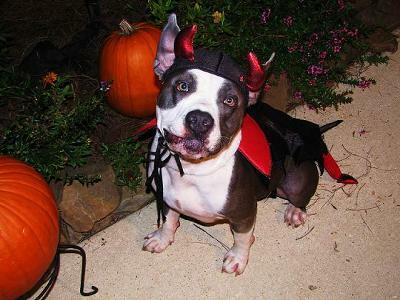 i looked forever to find a devil costume..what one is soo awesome! Great costume! Your dog is precious! I can tell the costume is homemade, you did a great job! Ahh he is soo pretty! Your right he is adorable! I hope he wins because he has my vote!